Epiphany Salon & Spa is an upscale Hair Salon in Naples, FL offering the very best in personal care, beauty and comfort. Our owner Paula ia a Master Hairstylist and a Vidal Sassoon Graduate, who is also an expert in wigs/hair pieces for both men and women, thinning hair and medical hair loss. 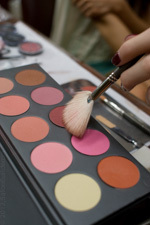 Jane Iredale- skin care make-up - exciting free make up lessons! Service hours are available, earlier and later then hours listed.